As a few of you know, I was an early employee at MTV, and a better ride was had by none. So, I’ve been kind of resistant to any kind of music programming venture over at Next New Networks. Until Tim Shey & Felicia Williams showed up in the office with director/producer Jack Ferry and the idea for $99 Music Videos. 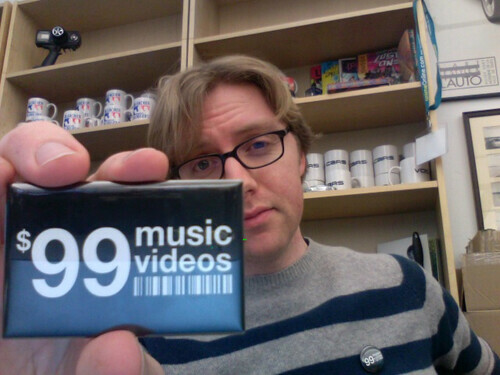 That’s right, a new music video every week (plus a making-of) by a new band made in one day for 99 bucks. Enjoy the videos here, and you can read a little more about the network here, here, here, and here. It’s fun going around again. Lunch yesterday was at Kate Mantellini’s (white bean chili!) with the lovelies Steve Woolf and Zadi Diaz. These guys are the brilliant minds behind Epic-FU (née the Jetset Show) and you should definitely check them out. Even though we don’t work together right now (Epic-FU used to be distributed by Next New Networks), we hook up every once in a while and learn a little something from each other. Happy Frederween! from justin on Vimeo. Jon Kane directs for Next New Networks. Next New Networks on Vimeo. I’ve mentioned director Jon Kane before (he made the great Oh Yeah! Cartoons bumpers for us) and I wanted to share with you the awesome tape he just made for Channel Frederator’s parent Next New Networks. 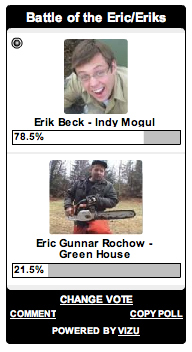 Have you ever watched Indy Mogul and thought to yourself, “Hey, this Erik guy is one sharp looking dude”? Well, you’re not the only one. Daisy Whitney from TV Week thinks so too. She’s compiled a list of The Hottest Male Web Hosts, and our very own Erik Beck is up against Eric Gunnar Rochow from Greenhouse. So if you’ve ever entertained those thoughts, now is the time to let those feelings rush forth. Vote Now! Polling ends Friday, May 2nd.